Wonpro, is the mother of universal receptacle, and the creator of universal receptacle. Wonpro, the first world-patented brand, establishes the kingdom of Universal Travel Adapter . 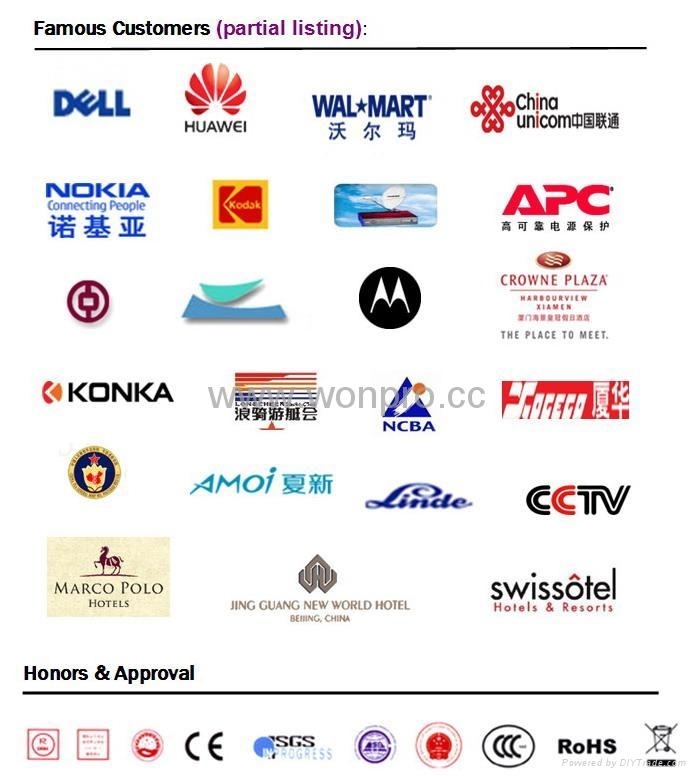 Wonpro, have patented its products in more than 50 countries, is generally recognized the No. 1 brand of high-grade low-voltage electrical product. Wonpro, is a super excellence manufacturer and supplier of high-grade low-voltage electrical product. We independently research, develop and professionally manufactured Wonpro advanced European type household switch, socket, universal receptacle, universal travel adapter, industrial socket, dynamo LED torch, plug, power strip, Universal socket extension, power cord series etc. Wonpro, established in 1989, has a R&D center, whose class and strengthen keep ahead in the world. We build manufacturing factory ourselves in Xiamen which have reputation international Garden City and locates in the east-south of China, build global customer center, and manufacturing center and quality management center, run integration modern management system and serve all customers from all over the world. All products are manufactured completely in conformity to the requirement of ISO9001:2008 International Quality Management System. Our products have obtained the certificate of CCC (China Compulsion Certificate) , IEC884,IEC669 of International Electromechanical Commission (IEC) ,CE of EU, RoHS, , and have received Adopting International Standard Product Marking Certificate. We devote to create universal receptacle to connect all parts of the world and provide all kinds of excellent solutions that freely accept and insert between all kinds of plug and socket in the whole world. And always regard supplying convenient safety and high-grade household and industry electrical appliance accessories to numerous consumers as our duties. We have taken the lead in creating universal safety receptacle to unify all kinds of plugs all over the world, built the global village of universal receptacle, and concentrated the conception of global village on the panel of Wonpro universal safety receptacle. Wonpro global integration products, superior in design beyond compare and high quality, firstly lead the world, solely step the global, go deep into the human life, and make all human being more safe, free and happy in the future life. 1. Patent universal receptacle can accept different plugs all over the world. 2. Universal receptacle can accept different plugs all over the world.